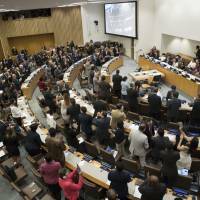 CANBERRA - In a historic vote at the United Nations on Friday, 122 nations adopted a new nuclear weapon prohibition treaty (NWPT) to ban the acquisition, development, production, manufacture, possession, transfer, receipt, testing, extraterritorial stationing, use and threat of use of nuclear weapons. The NWPT is the most significant multilateral development on nuclear arms control since the adoption of the Nuclear Non-Proliferation Treaty (NPT) in 1968. 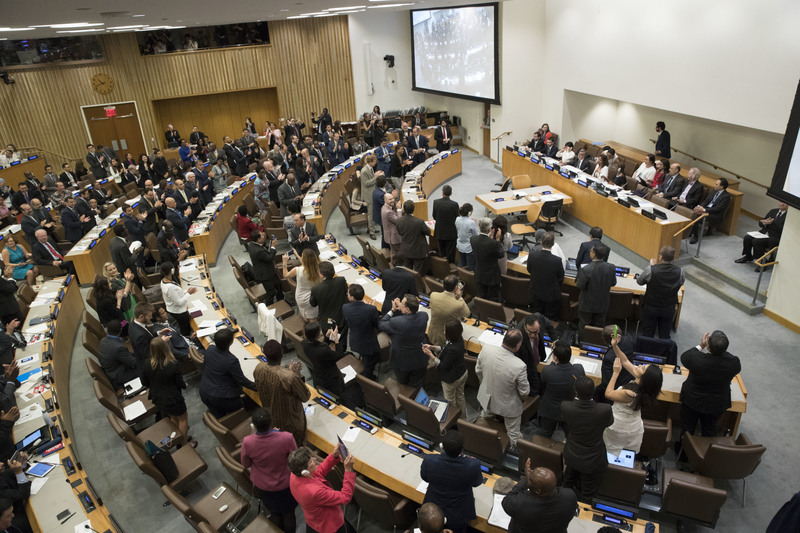 Many nations that have previously championed their disarmament credentials — Australia, Canada, India, Japan, Norway — have been outed instead as part of the problem with their embarrassing decision to boycott the duly constituted and U.N.-mandated conference. Although I focus on Japan, almost all the arguments apply equally to all the nuclear weapon possessing countries and allies who shelter under their nuclear umbrella. In sum, they have put themselves on the wrong side of history, geography, legality, morality and humanity. The U.N. General Assembly’s very first resolution on Jan. 24, 1946, discussed how to abolish weapons of mass destruction. Ever since, activists, NGOs, governments and the U.N. have been relentless in putting in place planks of an increasingly sophisticated normative architecture to limit the spread of nuclear weapon technology, materials and arsenals. At the center of the effort lies the NPT itself. But additional planks include the Comprehensive Test Ban Treaty (CTBT) following earlier successes in proscribing atmospheric and underground testing; the Nuclear Suppliers Group set up after India’s testing breakout in 1974; various regional nuclear weapon-free zones that cover the southern hemisphere and extend to a limited extent into the northern hemisphere in Central Asia and Mongolia; the Proliferation Security Initiative; etc. In addition, the International Atomic Energy Agency (IAEA) acts as the U.N.’s nuclear watchdog to ensure compliance with nonproliferation obligations. In other words history has moved in one direction only, albeit in a jagged rather than a linear progression, to limit and seek to end the existence of nuclear weapons and their use. The NWPT is part of that historically progressive trend. Four of the world’s nine nuclear weapon possessor countries are in Asia (China, India, North Korea, Pakistan), plus three umbrella states (Australia, Japan, South Korea). Russia and the U.S. also have a massive geographical footprint each in the Pacific. Four of the eight CTBT holdout states preventing its entry into force are Asian (China, India, North Korea, Pakistan). Asia is the only continent where nuclear tests are being carried out and warhead stockpiles are growing. Asia remains the only site and Japan the only victim of nuclear weapon use. The Indian subcontinent and the Korean Peninsula are two of the least unlikely theaters of a nuclear war and a direct China-U.S. confrontation from an escalation spiral starting in the South China seas is also possible. The Fukushima nuclear accident and independent assessments confirm continuing nuclear safety and security vulnerabilities across Asia. Conscious of these dangers, Asian states have overwhelmingly supported the U.N. conference and voted for the NWPT. The possessor and umbrella countries are out of step with their neighborhood in discounting the nuclear threats in favor of indefinite reliance on nuclear deterrence. The World Court’s Advisory Opinion of July 8, 1996, held that the threat or use of nuclear weapons would generally be contrary to the rules of international law, and in particular humanitarian law. The court could not confirm the legality of nuclear weapon use even in the extreme circumstance of the very survival of a state being at stake. And it significantly strengthened the nature of NPT obligations by affirming that states have an obligation to pursue in good faith and bring to a conclusion negotiations leading to nuclear disarmament. Yet 21 years later, there are still around 15,000 nuclear weapons in the arsenals of nine countries, all of whom are modernizing, upgrading or expanding nuclear weapon delivery platforms and some are increasing warhead numbers. The NWPT conforms to the NPT legal obligation to disarm. All those boycotting the U.N. conference disrespected a duly constituted multilateral process driven by a two-thirds majority of NPT members. Non-participation also put them in non-compliance with the obligation of all 188 NPT states parties, not just the nuclear powers, to pursue and conclude disarmament negotiations. Nuclear weapons obliterate the distinction between combatants and civilians that is central to every moral code in all cultures and civilizations. Most countries have chosen nuclear abstinence because people overwhelmingly abhor the bomb as deeply immoral. It is the most indiscriminately inhumane weapon ever invented. Its primary intended deterrent effect relies on the threat to kill millions of innocent civilians. Accurately called the balance of terror, deterrence is a euphemism for state-sanctioned nuclear terrorism. Given Japan is the emotional touchstone of nuclear weapon policy, its stance on the U.N. ban treaty is not just a deeply flawed misreading of international sentiment. It is also a deep betrayal of Japan’s own history, legacy and people. By coincidence the two highest international public offices in this sector, the IAEA director general and the U.N. secretary-general’s high representative on disarmament, are both currently held by Japanese. Both are likely to be somewhat embarrassed by Tokyo’s nuclear timidity. Ramesh Thakur is director of the Centre for Nuclear Non-proliferation and Disarmament, Crawford School of Public Policy, Australian National University.